'Evidence Of Ancient Fossils' In Greenland May Actually Be Stone Formations, Scientists Say A new analysis of what were initially thought to be microbial fossils in Greenland suggests they might instead just be mineral structures created when ancient tectonic forces squeezed stone. A new analysis of what were initially thought to be microbial fossils in Greenland suggests they might instead just be mineral structures created when ancient tectonic forces squeezed stone. While most of the structures point in one direction, the red arrow shows that some point in the other direction. "They're stretched-out ridges that extend deeply into the rock," said Joel Hurowitz, a geochemist at Stony Brook University in New York and an author of Wednesday's paper. "That shape is hard to explain as a biological structure and much easier to explain as something that resulted from rocks being squeezed and deformed under tectonic pressures." Asked what the chances were that the structures were created by ancient microbes, astrobiologist Abigail Allwood — of NASA's Jet Propulsion Laboratory and lead author of this second analysis — said: "I don't think there's much chance at all." The oldest widely accepted evidence of life on Earth is in Western Australia, where Allwood and other researchers revealed cone-shaped structures created by microbes in 3.5 billion-year-old rocks. A decade later, in 2016, she and others were surprised when scientists reported seeing similar structures in Greenland, in rocks some 200 million years older that had suffered much more heating and deformation under pressure during some of Earth's earliest days. "The preservation of those in such deformed rocks seemed incredible," Allwood says. "And in fact, it was. It wasn't credible." That was her conclusion after visiting the site in Greenland to collect samples of the rock. She immediately noticed that some of the structures were upside down, in a configuration that wasn't possible if they had been created by communities of microbial life growing upward from the sea floor. Allwood took samples of the rock back to the lab to map the structures' chemical composition with a prototype of an instrument called PIXL. It's a tool NASA will send to Mars in 2020, to look for evidence of past life on the red planet. She and her colleagues found that the supposed fossils don't have the kind of distinctive lamination seen when microbes build up minerals like a stack of pancakes. Instead, Allwood says, it looks more as though the Toblerone rock structure formed, and then other minerals later seeped into it from the outside. All of this is vigorously disputed by the researchers who originally claimed that the Greenland rocks contained the world's oldest fossils. They stand by that claim and say that Allwood and her colleagues based their work on just a cursory, one-day visit to the site. "This is a classic 'comparing apples and oranges' scenario, leading to the inevitable outcome that ours and their observations do not exactly match," Allen Nutman of the University of Wollongong in Australia notes in a written statement. 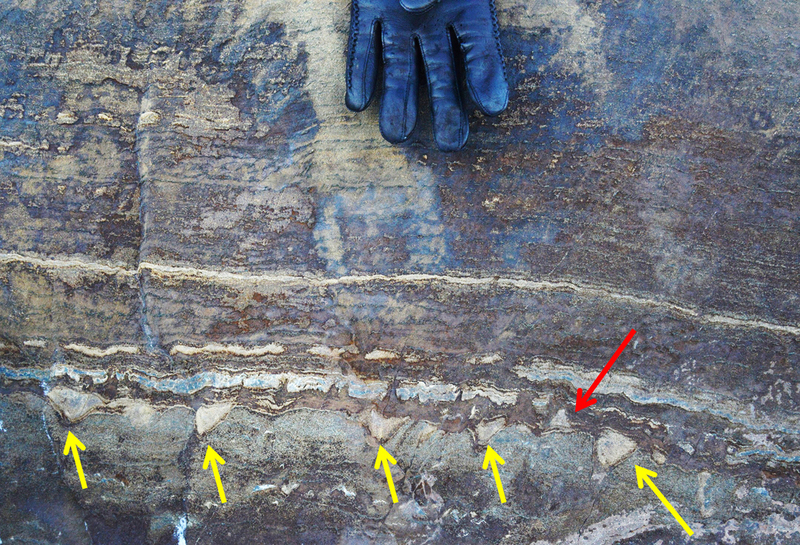 Vickie Bennett, of the Australian National University, added that she found the new study "disappointing" and "unfortunate" in that it "only serves to confuse" the earlier research that she and her colleagues did on these ancient rocks. "Basically they did not look at the same rocks — and the details matter," Bennett told NPR in an email. In her view, the rocks in the current study are a "poor-cousin equivalent to the rocks of our original study" and the new analysis "was not conducted with care." But Allwood rejects those assertions, noting that she sampled rock within 1 meter of the original sampling site. She also points out that Nutman recently maintained that Allwood's group had indeed sampled the well-preserved material — because he had complained that too much of "the key outcrop" had been taken by other researchers and wasted. Allwood says that her team collected their samples carefully and with the permission and guidance of Greenland's Ministry of Mineral Resources. She hopes to return next year with additional colleagues. "I have a hard time imagining that anyone who sees those rocks is going to be able to argue that structural deformation isn't at least a strong possibility for why those rocks look the way that they do," Hurowitz says. "I hope that people will look at this and say, 'Well, this is science doing what it is supposed to do.' We're supposed to test people's hypotheses and see if they hold up under scrutiny." Mark van Zuilen, at the Institut de Physique du Globe de Paris, wrote a commentary on this new work. He was not a member of either research team and points out that the rocky outcrop in Greenland "has not been discovered for long, and few researchers have studied this rock in relation to its geological surroundings." Van Zuilen says more research could lead to a better understanding of all the forces that shaped it.